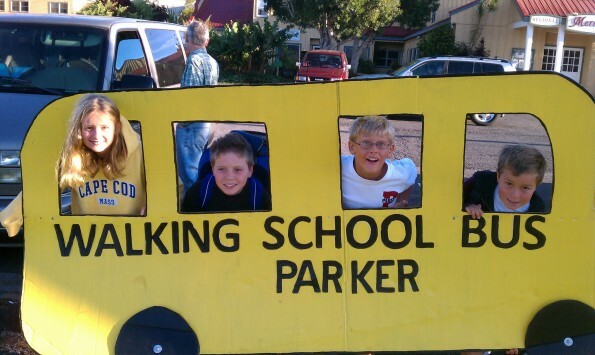 Parker's "Walking School Bus" with student walkers Lindy Billhardt, Ikaika Ward, Collins Billhardt and Bennett Varney. 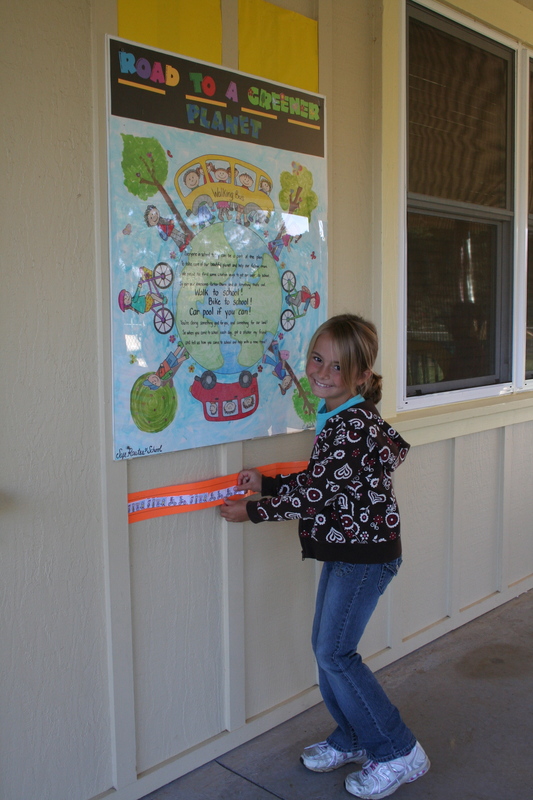 3rd grader Jenna Blevins affixes on "The Road to a Greener Planet," the sticker she earned for biking to school. 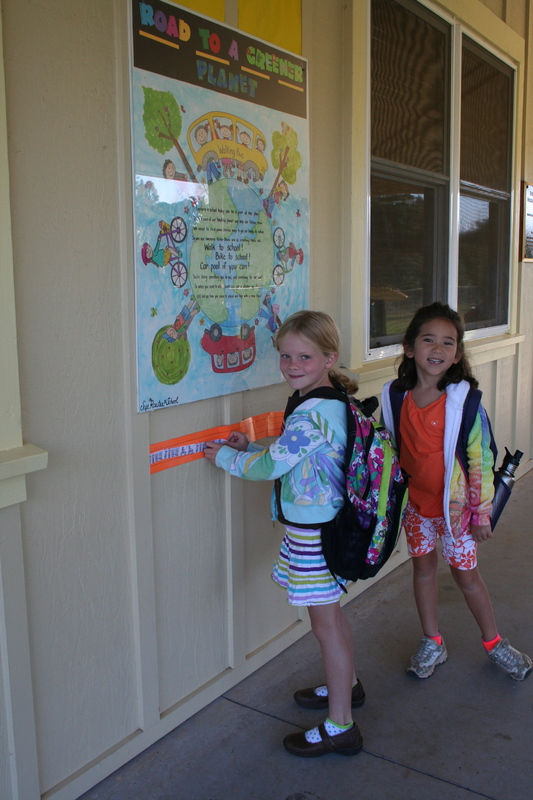 It was Healthy Routes to School Week in October for Parker Lower School. The event was launched by the school’s Safe Routes to School program, which encourages families to try alternatives to driving to and from school throughout the school year. On Friday (Oct 21), the program again started up its “Walking School Bus,” where students are dropped off at safe spots on the outskirts of Waimea to meet up with chaperones and other walking students, to then venture on foot to school together. They carry with them a big, yellow cardboard school bus. The Walking School Bus will continue to run a couple of times a month throughout the school year. Upon arriving at school, students who walk or bike to school get to put a sticker on a paper “road” on the wall just below the Road to a Greener Planet poster created especially for Parker School by artist Christine Arafiles. 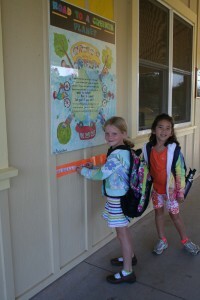 After biking to school, 1st grader Sadie Blevins places the sticker she earned on the "Road to a Greener Planet" as classmate Nai'a Jones looks on. Earlier in the week, the Safe Routes to School program brought in volunteers from PATH (People’s Advocacy for Trails Hawaii) to lead bicycle safety classes for 4th and 5th grades. PATH will also give pedestrian safety classes to 1st, 2nd and 3rd graders in November.